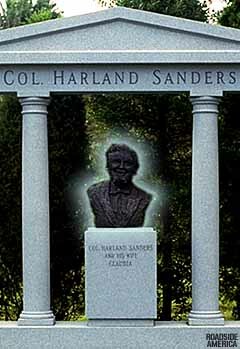 Harland Sanders was born on 9 Spetember, 1890 in Henryville, Indianapolis (USA). When he was six years old, his father died. This meant that his mother had to go out and work leaving him to do all the housework, and look after his three year old brother, and baby sister. These household duties included cooking and by the age of seven, Harland had become a master of several regional dishes. At the age of ten, Harland had little interest in school, so he dropped out after completing sixth grade, and went looking for work. His first job came at the age of ten when he started working at a nearby farm for just $2 per month. At the age of twelve, his mother remarried and Harland moved to Greenwood, Indianapolis and held a number of jobs over the next few years. His first job there was in New Albany as a Street Car Conductor. Other early jobs he had included six months as an Army Private serving in Cuba, operator of an Ohio River Steamboat Ferry, selling tyres, and finished off by working at a number of service stations. During this time Harland also studied Law by correspondence, then pratised in Justice of the Peace Courts, and was selling insurance policies. Other than cooking, the main job that he liked was during his time as a fireman for the railways which lasted five years and Harland would often talk about this. One of his talks about the time at the railways included this quote, "I started firing for Southern out of Jasper, in 1906. I was filling sand boxes in Jasper when a fireman failed to show up one morning. I showed the engineer that I could fire so he took me on the trip. I fired for Southern for the next five years." "About the most exciting thing that happened to me was a runaway train ride down Darlington Mountain near Russellville. It was a pretty steep grade and I was sitting with my head out the window enjoying the breeze when the engineer said, 'Harland, get ready to hang on because we don't have any brakes.'" When Harland was 40, he had his own service station in Corbin, Kentucky. At that time, there was no restaurant at the service station, so any meals prepared for travellers were done in his own kitchen, and they were served in his living room. And there were regular occasions that he had 15, or more guests for dinner. It was around this time he knew he was onto something as very soon, people started to come to his service station just for food, and not for petrol. As a result, Harland purchased the motel that was across the road. This motel included a restaurant which could seat 142 people. 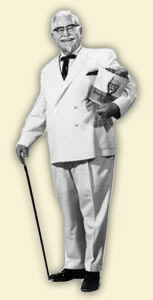 His popularity with cooking spread and soon got the attention of State Governor, Ruby Laffoon, who in 1935 made him a Kentucky Colonel in recognition for his contributions to the state's crusine. And in 1939, the restaurant started appearing in Duncan Hines "Adventures in Good Eating", a famous guide covering American restaurants at the time. One thing that Harland always did was to experiment with food to try and improve his dishes, and make them more popular. These experiments included finding suitable ingredients to add to the flour which coated his chickens. One of the more successful experiments happened in 1939 with the mixture of the eleven herbs and spices which now form the coatings to his chickens. In those early days, Harland's biggest problem is that customers had to wait about 30 minutes for the chicken to be cooked in an iron skillet. Most restaurants at the time would cook chicken in deep fat, which would only take a few minutes. However, he refused to cook chicken in deep fat as he thought it ruined the flavour. Then in the late 1930s he was invited to a demonstration of a product he called a new fangled gizmo, which turned out to be the newly invented pressure cooker. Harland liked what it could do to green vegetable, and how quick they were cooked. So he wondered what it could do with chicken and bought one. After a number of experiments, and modifications to the cooker, he could cook chicken quickly, and the taste was even better than before. 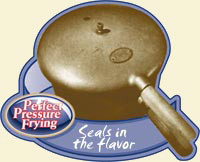 This original Pressure Cooker is one of the exhibits at the KFC museum in Corbin. 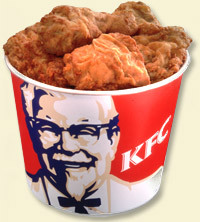 Pressure cookers are still used today by KFC in the cooking of chicken. Harland also liked to keep his kitchen clean, and to be able to show his customers that he had high standards. To achieve this, the kitchen was painted white so any signs of dirt could be spotted, and to make cleaning easier. Also, there were holes in the wall to allow customers to see into the kitchen, a feature which came standard in all KFC restaurants in 1982, something that is seen in a number of other restaurants worldwide, but it is not certain if Harland started the idea, or if he copied someone else. In 1948, as a result of marriage problems, probably because he spent more time cooking than with his wife, he divorced his wife, Josephine. Later that year, he married Claudia Price, who was a waiter at his restaurant. However, in the early 1950s, an interstate bypass was built, which completely bypassed the town of Corbin. Business was affected, and predicting that he would eventually be bankrupt, Harland auctioned off his operations, and paid all money he owed. All he had left to live on was Social Security Cheques of $105 per month. And at his age, he was not expecting to work again. In 1952, Harland had a chance meeting with a Peter Harman, who owned Harman's Cafe in Salt Lake City, Utah, another popular, and famous eating place. And Peter was a skilled business man. As a result of this meeting, a business relationship was established, and Peter convinced Harland to cash in his social security cheques to start a franchise for chickens coated in Harland's recipe. Soon after this meeting, Harland, with his wife, Claudia started travelling around visiting restaurants. And if a particular restaurant agreed, he would cook his chicken dish coated with his herb and spices. Many liked how the chicken was cooked and included it on their menus. His fee for using the mixture to the restaurants was five cents per chicken that was covered. The first years of the franchise was a struggle, and Harland comments on this by saying . "One of our biggest problems getting started was money. After we sold the restaurant at auction, I was getting $105 a month from social security. That paid for my gas and the travel needed to get the franchises started. Lots of nights I would sleep in the back of my car so I would have enough money to buy cookers the next day if someone took a franchise." His wife also commented on the business at the time by saying "He helped a lot of people go into the restaurant business. "Sometimes their pies or meats or vegetables wouldn't be just right so he began to show them how to do all of it. He wanted the restaurants that served his chicken to have good food." 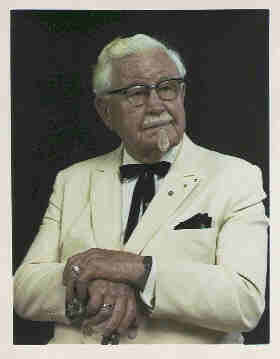 In the late 1950s business was improving and the company, Kentucky Fried Chicken Inc was formally established. On regular occasions, Harland would be asked to appear on television or radio interviews. It was on such an occasion that the only clean thing he had to wear was a white palm suit. This was that popular, it was all he would wear on all future public appearances, going through about eight suits a year. By 1964, there were approximately 600 restaurants in the United States using his chicken recipe when he sold the franchise to a group of investors for $2 million. Part of the conditions of sale is that Harland would remain on the board of directors, and receive an annual lifetime salary of $40, 000 per year. One of these investors, John Brown, later became Governor of Kentucky from 1980 - 1984. To raise funds for the franchise, the investors sold shares in the company on 17 March 1966, and was first listed on the New York Stock Exchange on 16 January 1968. The last time the franchise was sold, it was purchased by Pepsi in 1986 for US $840 million. Pepsi also run four other food franchise's. Other than KFC, only one other of these, Pizza Hutt, is in New Zealand. Although Harland had sold the franchise, he remained involved with the investors, and in 1976, he was the second most well known celebrity in the world according to an independent survey. His involvement in the company included visiting the restaurants on a regular basis, travelling approximetly 160, 000 km per year. Although his now famous recipe was first discovered in 1939, he never wrote it down until the 1960s. And the mixture was transported to the restaurant in his car. 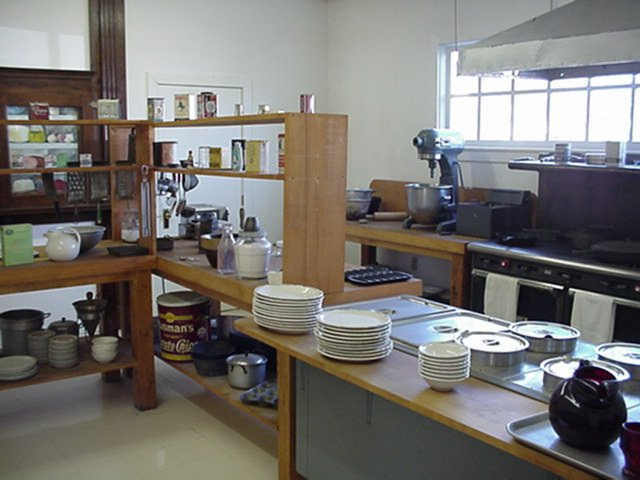 As for preparing the recipe, Harland is quoted as saying "I hand-mixed the spices in those days liking mixing cement on a specially cleaned concrete floor on my back porch in Corbin. I used a scoop to make a tunnel in the flour and then carefully mixed in the herbs and spices." Nowadays, only a handful of people actually know the recipe, and each has signed a very strict confidentiality agreement. The original recipe is secured in a safe in Louisville, Kentucky in facilities, which they say is better than Fort Knox. As for actually preparing the mixture, several companies are involved, none of which have the completed receipt and the operations are computer controlled to ensure that everything is mixed together correctly, and at the right time. The mixture is then exported to all the countries where the franchishes are. The chickens themselves originate from within the country a franchise is located in. In regards to today's operations about the recipe, Harland is quoted as saying "It boggles the mind just to think of all the procedures and precautions the company takes to protect my recipe," the Colonel said. "Especially when I think how Claudia and I used to operate. She was my packing girl, my warehouse supervisor, my delivery person - you name it. Our garage was the warehouse." "After I hit the road selling franchises for my chicken, that left Claudia behind to fill the orders for the seasoned flour mix. She'd fill the day's orders in little paper sacks with cellophane linings and package them for shipment. Then she had to put them on a midnight train." Harland was still involved with the franchise when he was diagnosed with leukaemia in 1980, and died later that year as a result at the age of 90, on 16 December. Due to his popularity, he is the only person connected to the food industry who has a statue in the state capital of Kentucky.